There’s rarely a right answer when it comes to Slay the Spire. Every decision has the potential to make or break a run in the roguelike deckbuilder, and a choice made half an hour ago can come back to bite you when you least expect it. It’s a game that takes away more than it gives, which only makes it more difficult to explain why it’s so hard to stop playing. But when things do go right, the game can quickly transform from cruel overlord into a combo-driven power fantasy, more ruthless than any other card game I’ve played this year. Each run starts with a choice of character class. The powerful Ironclad comes with a healing passive that allows for aggressive, high-cost moves. The deadly Silent is a master of fast, low-cost attacks, but can also wield an arsenal of deadly poison cards. And the Defect is a machine gone rogue, requiring a careful balancing act of its Orb abilities to whittle down its opponents. Each of these classes has its own unique cards that play to its strengths, but managing these cards and learning the game’s synergies are crucial if you’re to find success. Every time you complete an encounter against an enemy you’re rewarded with a choice of three cards. These are small decisions initially, but those you make on the first few floors of the titular tower will go on to shape your approach for an entire run. That’s why learning the ins and outs of your deck as it continues to evolve is a central part of the game’s appeal. While cards are important to Slay the Spire, they don’t paint the full picture. Once you add powerful relics into the mix, your deck can evolve into a beautiful and efficient vehicle of death, letting you carve through enemies. Wrist Blade is perfect for the Silent’s shiv decks, boosting all zero-cost cards by three damage, while Thread and Needle gives you passive armour at the start of every turn. Figuring out these combinations might not be as cerebral as Hearthstone theorycrafting or a game of Artifact, but watching as the various building blocks of your deck slide into place is just as satisfying as anything Slay the Spire’s triple-A contemporaries have to offer. As you continue to climb the tower, you can gain extra relics and rare cards from random events. Heading for those can be a helpful way to avoid damage, but you never know what might be lurking in those secret rooms, and trying to find a route past monsters can mean you miss out on valuable cards. At campfires, healing might give you enough health to get past that next boss and secure a relic, but forging an upgrade for that valuable card could be vital for the rest of the run. As you add more cards to your deck and more relics to your collection, the potential for dazzling combos and punishing synergies grows – it just keeps going. From slow beginnings, each new attempt to climb the Spire can see you carving through enemies while barely breaking a sweat, only to see everything you’ve built crumble around you in the face of a heartless boss. 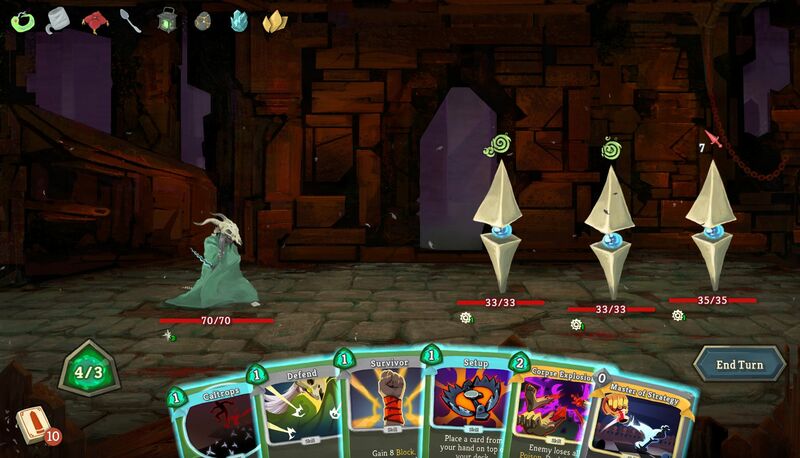 Slay the Spire has had plenty of card game competition this year, but its dizzying highs and brutal lows have allowed developer Mega Crit to stand shoulder to shoulder with some of the industry’s biggest names.